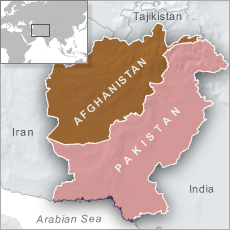 GHULAM KHAN, PAKISTAN-AFGHAN BORDER — Pakistan says a unilateral construction effort will have fenced off nearly half of its largely porous border with Afghanistan before the spring fighting season in the neighboring country. Military officials say the pace of the massive border security project has lately been accelerated to guard against a possible spill over of “terrorism” from Afghanistan in the event of a widely anticipated U.S. military drawdown there. “(Almost) 900 kilometers has been completed and the remaining 300 kilometers, inshallah (God willing), we will be completing in two to three months time,” army spokesman Major-General Asif Ghafoor told reporters in Ghulam Khan, one of the several border crossings. “Thereafter, wishfully by the end of this year, or at best mid of next year, we will be able to compete the entire (2,600 km) fencing,” he said. “Our biggest worry now is the reconciliation is taking place in Afghanistan and it is going to be a mess whether Afghanistan is exited by the U.S. in an announced and organized way or abruptly. We are doing this fencing with speed we are doing development (in border districts) with speed. We will not let that thing (terrorism) come to Pakistan,” he vowed. Ghafoor insisted the fence is strengthening Pakistani efforts to prevent cross-border terrorism from threatening security gains the country has made over the past decade. North Waziristan used to be known as the epicenter of international terrorism and a hub for the outlawed Pakistani Taliban. U.S. and Afghan officials have also long alleged Islamabad’s counterterrorism efforts ignored sanctuaries of the Afghan Taliban on its soil. “Attempts to physically infiltrate the border have been completely blocked In areas where have erected the fence. Fire raids at our posts from the other side are still continuing but inshallah (God willing), they will also come to an end after all the forts and an electronic surveillance system are in place. With the help of this fence, everyday we are gaining more strength to stop the terrorism from that side,” Ghafoor noted. U.S. Sen. Lindsey Graham during his visit to Islamabad last month praised Pakistan’s border fencing effort and emphasized the need for a matching response from the Afghan side. “There is a big debate about building a wall back home to make us safe. If you want to see somebody building a fence or wall come to Pakistan. The plan to secure the border on the Pakistani side is very robust,” the American senator noted. Gen. Ghafoor called for the Afghan government to reciprocate and boost border security on their side to promote regional peace, though he acknowledged Afghan forces have capacity and manpower issues. Kabul has been critical of Islamabad’s border security measures because Afghanistan traditionally disputes the former British era demarcation called the Durand Line. “We have achieved peace in our country. But if the situation continues to be volatile and chaotic in Afghanistan we fear terrorism would hit back Pakistan. That’s what prompted us to begin fencing of our border. Only legal entry will be possible through dedicated terminals we are or have established at the border once we are able to install the fence along the entire boundary,” Ghafoor stated. “I am happy and feel safe. Reconstruction activities are underway. But that is not enough,” said Usman Wazir, a trader by profession who recently returned home with his family. “We face electricity outages for the whole day. Our (cell) phones are not working and we don’t have finances to revive our businesses,” he lamented. The new tight border controls and visa restrictions have undermined Pakistan’s already mistrustful political relations with Afghanistan in recent years. It has also impacted negatively economic and trade ties between the neighbors. Around 60,000 people commute across the Pakistan-Afghanistan border on a daily basis. That cross-border movement continues and Pakistani officials promise things will improve further due to measures being taken to solidify bilateral ties in all fields. “This measure is a major step to promote bilateral trade and transit of goods between the two countries and also to facilitate enhanced people to people contacts. Pakistan will take more such steps to further solidify economic and trade relations as well as the strong bonds between the peoples of the two countries,” says Foreign Ministry spokesman Mohammad Faisal. He noted that Pakistan remains the largest market for Afghan exports, receiving almost 60% of the neighboring country’s total exports, and estimated that Pakistan consumes 90% of Afghan fresh fruits and vegetables. Faisal said Islamabad waived off regulatory duties on fresh fruit imports from Afghanistan, leading to a 29% increase in Afghan exports to Pakistan. U.S., Taliban Joint Commission to ‘Finalize Mechanism’ for Troop Pullout Late Feb.
Opinion: As U.S. Seeks To Withdraw Troops, What About Afghanistan’s Women?